Sourdough starter is easily made — all you need to do is whisk together some flour and water — and its benefits are many. Not only does it give baked goods, from breads to pancakes to waffles to muffins and everything in between, great flavour and texture, it’s also really good for you because of its amazing probiotic benefits. So, I have my sourdough starter from which I’ve made bread, pizza and focaccia, now what? Breakfast pancakes! These are US style rather than French crepes and are fluffy and melt-in-the-mouth awesome. My beloved and I have become instant converts. This recipe is perfect for a big crowd — you can just pop one or two large pancakes into the oven to feed everyone together, rather than slaving over a hot stove making them one by one. I like to serve them at week-ends so these vegan, sourdough, pancakes with fresh seasonal fruit get your Saturday or Sunday off to a perfect start. 1. 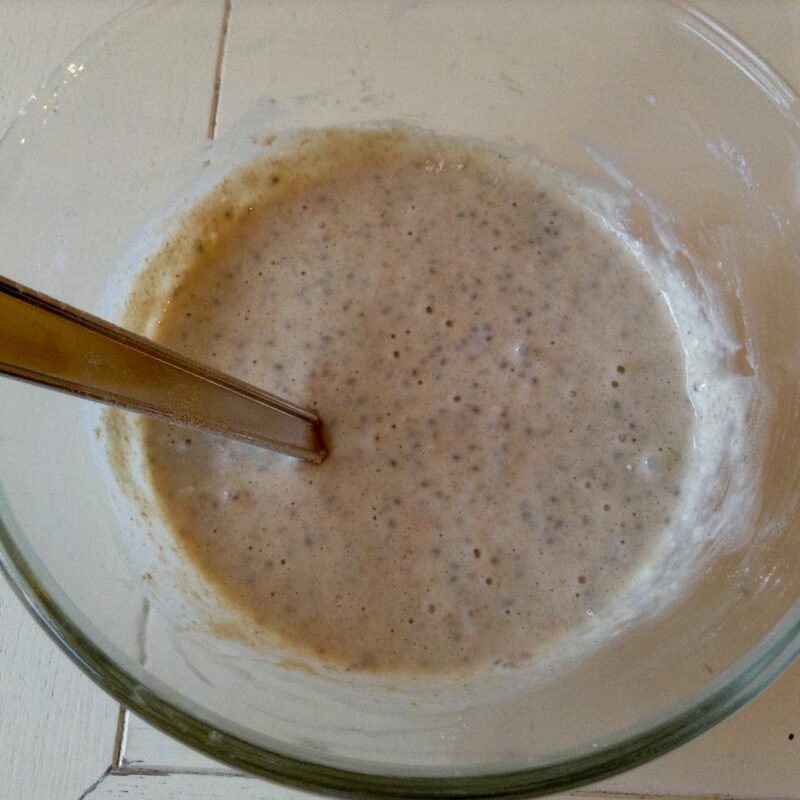 Make the sourdough sponge the previous evening by mixing in a large bowl the sourdough starter with the flour, sugar, almond milk and apple cider vinegar. 2. Cover with cling film (plastic wrap) and allow the batter to stand overnight in a warm spot. In the morning, it should be puffy and visibly bubbly. 4. Before making the pancake(s), preheat the oven to 230 ̊C/210 ̊C fan/450 ̊F/gas Mark 8. 5. 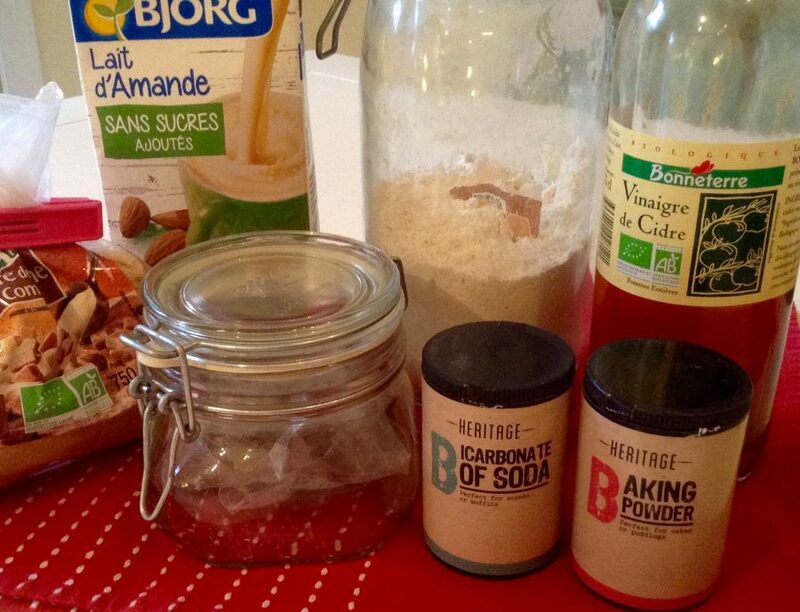 Add the bicarb (baking soda), applesauce and chia/flax eggs to the sourdough sponge and mix thoroughly but gently. 6. Heat an oven-safe frying pan on the hob (stovetop) add sliced fruit, coconut nectar, seeds from vanilla pod and alcohol. Cook gently until fruit softens, and all the liquid is gone. Turn off the heat and remove half of the fruit (for the second pancake) and arrange the remainder to cover bottom of the pan. 7. Pour half the pancake batter over the fruit. Immediately place the pan in the oven and bake for 20 minutes or until the pancake appears golden-brown and the sides are pulling away from the pan. 8. Flip the pancake upside down onto a plate and cover with aluminium foil to keep warm. Repeat the process one more time to make the second pancake. 9. Serve the pancakes warm with maple syrup or anything else your heart desires! 10. 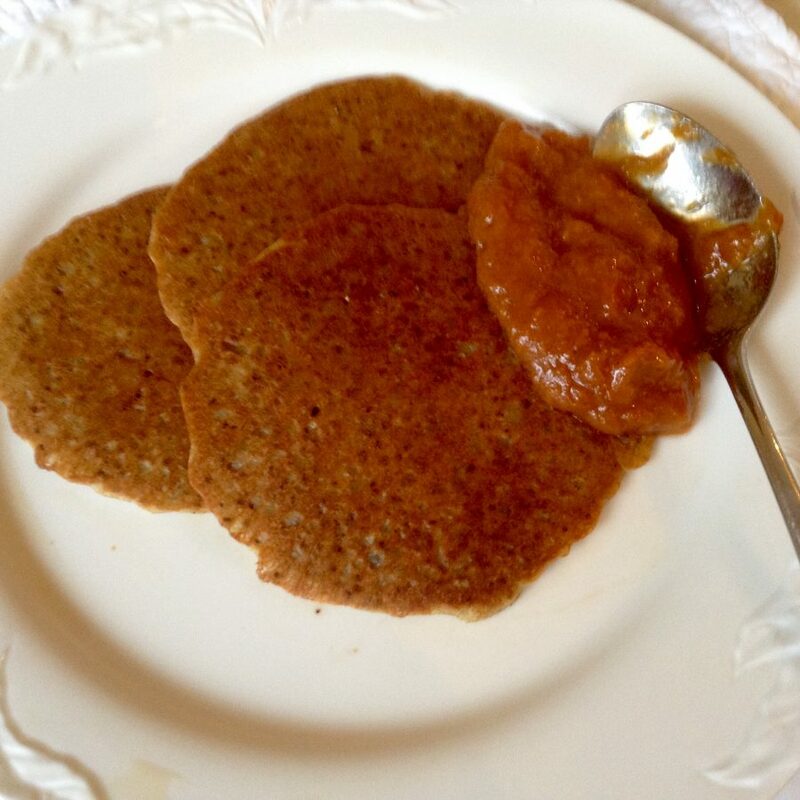 Any uneaten pancake – as if! – can be stored in the fridge for a couple of days. You can either reheat or eat cold. My beloved was due back from his business trip late on Saturday evening. I was just about to go out, having wrapped up reviewing the day’s stage for VeloVoices, when my phone rang. It was my beloved who had missed his connecting flight from Madrid to San Sebastian due to the late arrival of his inbound flight from Heathrow. He’d be back around midday on Sunday. While he’s been away I’ve been enjoying the jazz festival. Mornings I head for my morning walk along the beach before going to my favourite breakfast spot, to order an americano y tostada con tomate, the latter comes with olive oil, salt and a raw tomato paste (header photo of my DIY version). It’s delish and has replaced my usual avocado on toast. I sit outside and listen to the band playing in the San Martin market. They don’t appear to be part of the Festival, I think they’ve just jumped on the bandwagon. Breakfast over, I head to La Brexia market for fresh fruit, salad stuff and olives before wending my way back to the flat, again via the beach. And no, before you ask, the shins still haven’t tanned! Afternoons have been taken up with watching the Tour de France and the European Water Polo Championships. Most evenings I’ve walked along the seafront, sat on a bench in the park opposite the Town Hall and listened to whoever’s been playing on the stage there. Some evenings I’ve treated myself to a sorbet from my favourite ice cream shop, other times just some water from the Heineken stand – the Jazz Festival is sponsored by Heineken. If the music hasn’t been to my taste, I’ve continued my pursuit of the best Aperol Spritz in town. When it comes to bars, I look carefully at its clientele. San Sebastián has loads of elderly – as in much older than me – chic ladies, probably widows. They tend to gather in groups in the evening to enjoy a chat and a cocktail or two with a pintxos or two. If there’s plenty of glamorous grannies, I’ll go inside or sit outside. I now have further contenders for the prize and will allow my beloved to have the casting vote, something he rarely enjoys. Just because I can’t have dairy or eggs doesn’t mean I can’t have pancakes on Shrove Tuesday, or any other day for that matter. I woke up this morning to find it grey, overcast and wet, not what I ordered. 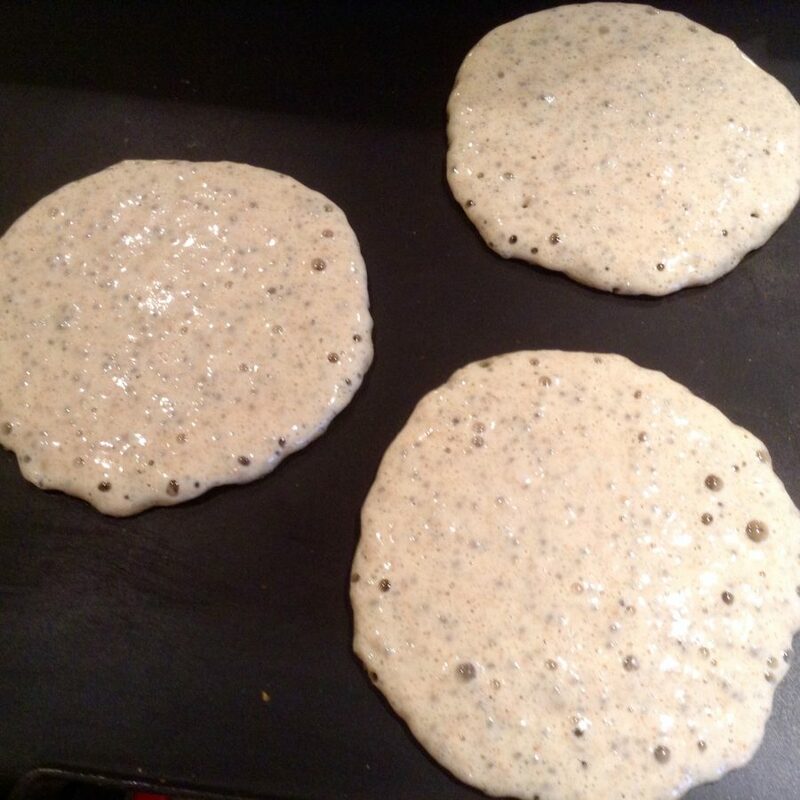 So, after a quick session on the home trainer in lieu of my morning ride, I made pancakes for breakfast and the world immediately seemed a better place – the power of food! 1. Whisk together the chia seeds with 2½ tbsp of cold water, then set aside to thicken. 2. 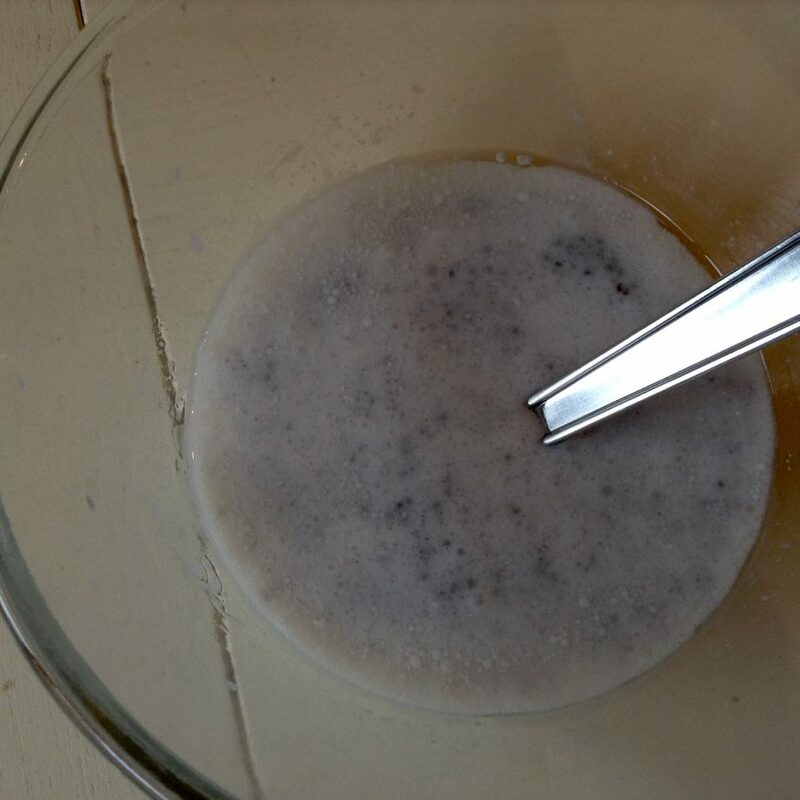 Combine the almond milk and cider vinegar, add the melted coconut oil, then whisk in the chia seed mixture. 3. Sift and combine the flour, sugar, baking powder, bicarbonate of soda and salt, then make a well in the middle. Gradually pour in the wet mixture, stirring continuously until combined. Don’t worry about a few lumps. Set aside for -10 minutes. 4. Turn oven on low. Heat a tiny amount of coconut oil in a large frying pan over a medium heat, or like me use a non stick pan without addition of further fat. Add a small ladleful of the batter per pancake to the pan, you’re aiming for a scotch pancake size, then add more ladlefuls of the batter, ensuring they’re nicely spaced out. You’ll need to do this in batches. 5. 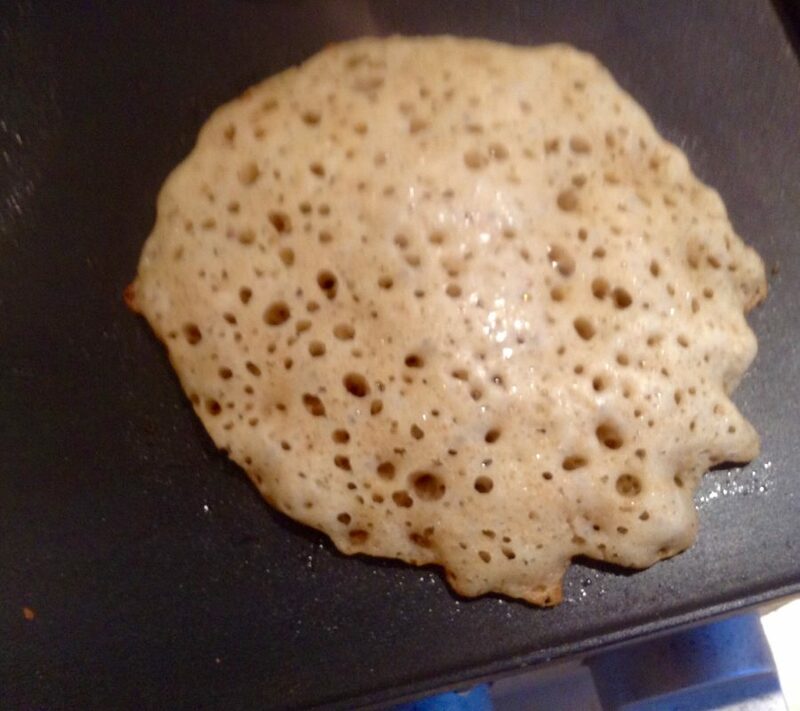 Cook for around 2 minutes, or until golden underneath and little bubbles start to appear on the surface – a bit like a pikelet. Then use a palette knife to flip them over. Cook for a further 2 minutes, or until golden. Place in the oven to keep warm while you make the remaining pancakes. With homemade apricot compote, not much of a contrast in colour but it tasted sooo good. 6. Serve with a dollop of coconut yoghurt, a drizzle of maple syrup, a spoonful of fresh fruit or fruit compote, or all of them if your heart so desires and enjoy! 1. You can grind the chia or flax seeds beforehand for a smoother batter if you prefer, but I don’t mind leaving them whole. 2. You can add flavourings, such as cinnamon or vanilla essence, to the batter. Probably no more than 1/2tsp. 3. You can use any kind of milk, I just prefer unsweetened almond. If you use a sweetened milk, omit the tablespoon of sugar. 4. Just before you turn the pancakes for the first time, you can add fresh or dried fruit to taste – banana, raisins, blueberries, strawberries, apples – to the batter. My beloved and I generally go for longer rides at the week-end, calling for a more substantial pre-ride breakfast. I haven’t made him pancakes for a while but I recently found a recipe for Turmeric Pancakes. Yes, I know that doesn’t sound terribly inviting but they were surprisingly fluffy and delicious. They also ensured I had my daily dose of turmeric. 1. Preheat heavy bottomed non-stick pan or grill. 2. Combine everything in a food processor. It should take no longer than 30 secs and the texture should be similar to softly dropping cake batter. 3. Portion batter into equally sized portions (4 or 6) using an ice cream scoop, or something similar, and plop onto cooking surface. They should take 2-3 minutes to cook on each side, just flip with a fish slice. 4. Serve with whatever takes your fancy: non-dairy yoghurt, maple syrup, fresh fruit or, in my beloved’s case, crispy smoked bacon and maple syrup!